This Sunday, May 21, I organize a hike from Côte d'Arbroz, 55 km from Geneva. Departure from the Côte d'Arbroz, the Villiaz. Good trails that join the Col de la Basse. Go north on the grassy slope above the mountain pastures. After one kilometer, we arrive at Col Ratti. The summit is located a little higher, dominated by the walls of the Roc d'Enfer. After the break snack, return by the Coll de l'Encrenaz and small hamlets. 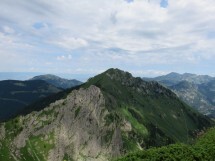 A gradient of 900 m and a distance of 14 km. Walking time: about 5 hours.